Description: This poster is an offset litho in black, green and yellow. It features a drawing of a woman breaking a chain while two other women look on. 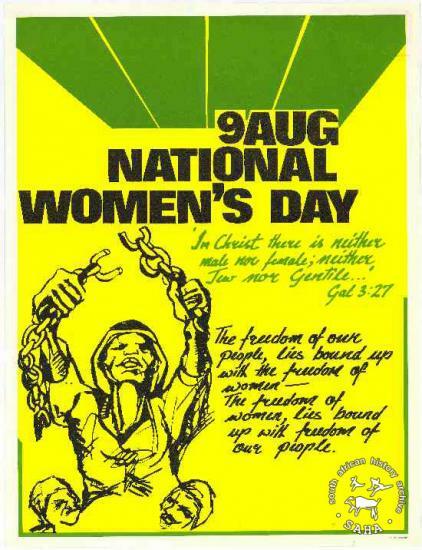 The text reads: "9 AUG : NATIONAL : WOMEN'S DAY : In Christ there is neither male nor female; neither Jew nor Gentile... : Gal 3:27 : The freedom of our people, lies bound up with the freedom of women -- The freedom of women lies bound up with the freedom of our people.". Included in SAHA exhibition kit and virtual exhibition, titled 'Women hold up half the sky: commemorating women in the struggle'.